Danon speaks about his challenge on Netanyahu for Likud leadership as roughly 100,000 party members head for the ballot boxes. Likud members are going to the ballot box on Wednesday to vote in primaries, deciding the party's Knesset list for general elections on March 17 as well as determining who will lead the party - Binyamin Netanyahu or Danny Danon. An additional question in the primaries vote will have Likud members decide whether or not to grant the party leader the ability to reserve two seats for members of his choosing in the party's list, as requested by Netanyahu. 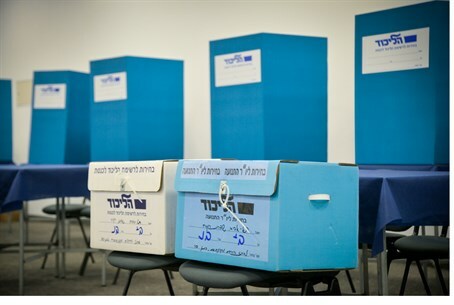 A total of 96,651 Likud members are set to vote at 600 voting ballot boxes located at 115 sites around the country. Danon, who serves as Likud Central Committee chairperson, told Arutz Sheva that he is convinced those who are loyal to the land of Israel will have the final say in elections. "There are all sorts of journalists in the left who say that we are the extreme right - right-wingers are always extremists and leftists are always moderate," said Danon. "I'm a proud right-winger and I will continue to say that." Possibly responding to calls to unify behind Netanyahu, he added "I hear lots of advice being given to us about who we need in the Likud. So please, let them not try to teach us what's good for the Likud, and if Likudniks think that those who are loyal to the land are good for the list, then that's the way of the Likud. I come with the internal truth and I ask for recognition of that." "We are prepared for a large democratic demonstration, 96,000 people will arrive...to exercise their democratic part (in the process), I am proud to represent together with my colleagues our positions and also to receive (voter) confidence again," said Danon. Noting on his running both for the party list and party leadership, the MK added "it's clear to me that managing two battles on the same day isn't easy, but I believe that I will merit renewed confidence. Likud members will decide...if they want the status quo, or to go on a new path of loyalty to the way of the Likud." Danon had a falling out with Netanyahu during Operation Protective Edge, when Netanyahu fired him from his post as Deputy Defense Minister for criticizing management of the operation. Danon at the time slammed Netanyahu for agreeing to numerous ceasefires with the Hamas terrorist group, even before the terror tunnels were lethally unveiled and dealt with, thereby potentially leaving them as a threat. However, Danon clarified "we're working together despite that there are disagreements, I don't hold grudges. We needed more deterrence in Protecitve Edge, that's what I reasoned, but I respect the prime minister." "I also opposed the release of the terrorists and announced I would not remain in the government if it did the fourth batch, and I'm glad things were as they were," he said, noting on the 78 terrorists including many murderers released as a "gesture" to the Palestinian Authority in peace talks that collapsed, halting the final batch of releases. Emphasizing Likud unity, he added "our true opponent is from the outside, and that's the connection between Buji (Yitzhak Herzog) and Tzipi (Livni)" in their newly formed joint Labor and Hatnua party that has roughly achieved parity with Likud according to polls. Danon pledged to fight the High Court ruling ordering the destruction of Amona in Samaria within two years, saying "it's important that the defense minister position will stay with the Likud, that's important for settlement and building in Judea and Samaria." Given that Israel has yet to annex the region, its management falls under the responsibilities of the defense minister. "The decision on Amona was a mistaken decision, and I will act to overcome the ruling; there are many ways including possibilities of compensation and others, there's no logic in destroying homes," said Danon. Netanyahu has yet to take a stand on the ruling, with Shevah Stern, head of the Likud's "National Headquarters" faction and a candidate in the Likud primaries running for the party's Knesset list, this week publicly calling on him to obligate himself to arranging the legal status of Amona.